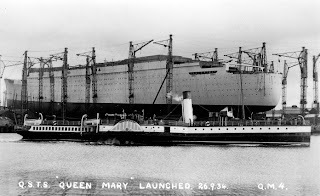 The first RMS Mauretania was launched in 1906. At the same time as the breaking-up of the famous Cunarder Mauretania at Rosyth on the Firth of Forth, the 35-years-old Union Castle liner Saxon is in the hands of shipbreakers at Blyth, Northumberland. The science of shipbreaking is not the chaotic undertaking that many laymen must imagine. Experts estimate that 9.5 per cent of the destruction that takes place when a great ship is dismembered becomes reconstruction in the great steel works, engineering shops, foundries, and mills to which the material is consigned. The thousands of steel plates from her hull and special alloy steel from various machinery retrieved by British shipbreakers find their way in large quantities to their places of origin, the famous steelworks of Sheffield; and a "quick" market is always available for the copper, brass, bronze, gunmetal, zinc, and lead that is stripped from an old ship. 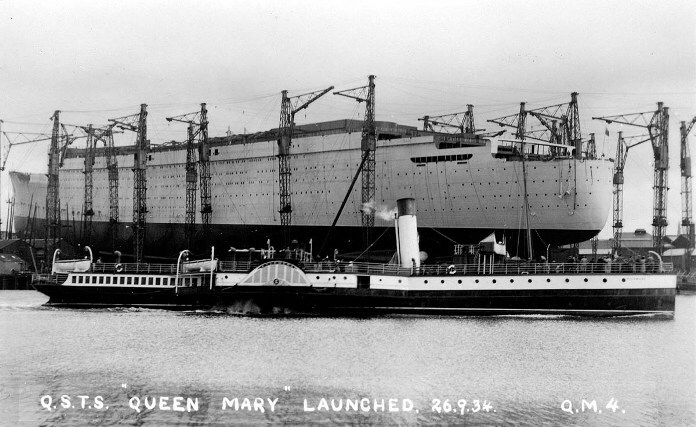 A correspondent in the London "Observer," referring to the scrapping of the Mauretania, says that some of the best panelling in the notable old ship will be "grafted" into her modern rival, the 73,000 tons liner Queen Mary--a fitting transfer from a ship that for more than 20 years was queen of the seven seas, to the world's greatest ship, which will bear the name of the Queen of England over those same seas. The usual practice of shipbreakers is to bring the doomed vessel to the quayside, liberate swarms of workmen over her decks, which are stripped systematically as she is cut down and gutted. The next stage is the tidal dock, where the remaining hulk is floated on the sloping ways on which she rests when the tide recedes, leaving her exposed for dismantling, which is done in series as the tide permits. The "Observer's" correspondent recalls that the Blyth shipbreakers are proud of the history of their craft. They began with wooden walled ships and continued until war caused the influx of a tragically large number of ships into the breakers' yards. Among these were famous battleships that took part in the battle of Jutland, most notable among which was H.M.S. Lion (36,350 tons), on the quarterdeck of which Admiral Beatty received the German admirals when they came to surrender their fleet. Writing in the same journal, Sir Arthur Rostron, a former commodore of the Cunard Line, and commander of the Mauretania, discusses a ship's personality. "Call it what you will," he writes, "but when the captain loves his ship as I did there is a personality which pervades both the ship and the man." Sir Arthur Rostron quotes instances in which this belief seemed to be well justified. Once on the Mediterranean cruises, the ship went to Constantinople. She had to "lay to" off Chanak in the Dardenelles. "Somehow," he says, "neither the ship nor myself cared for a Greek pilot to handle her, so as we were getting under way I told the pilot that I would take her up myself, having been up and down the Dardenelles many times previously.